Researchers used a special imaging technique with the panoramic camera on NASA's Mars Exploration Rover Opportunity to get as detailed a look as possible at a target region near eastern foot of "Burns Cliff." The intervening terrain was too difficult for driving the rover closer. The target is the boundary between two sections of layered rock. The layers in lower section (left) run at a marked angle to the layers in next higher section (right). This view is the product of a technique called super resolution. It was generated from data acquired on sol 288 of Opportunity's mission (Nov. 14, 2004) from a position along the southeast wall of "Endurance Crater." Resolution slightly higher than normal for the panoramic camera was synthesized for this view by combining 17 separate images of this scene, each one "dithered" or pointed slightly differently from the previous one. Computer manipulation of the individual images was then used to generate a new synthetic view of the scene in a process known mathematically as iterative deconvolution, but referred to informally as super resolution. 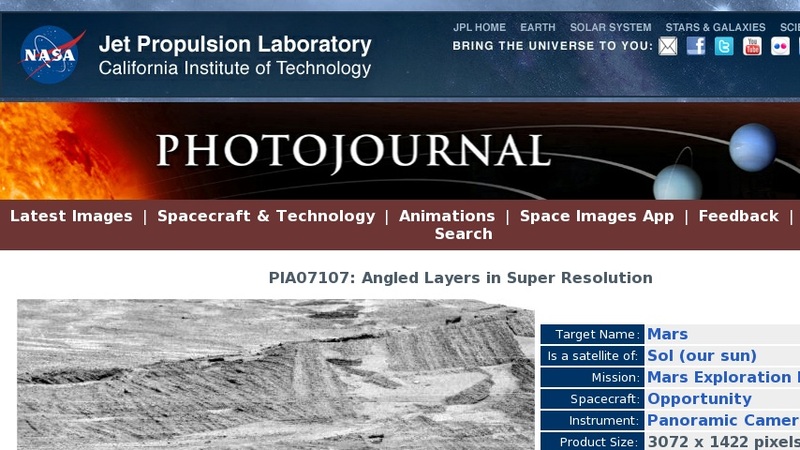 Similar methods have been used to enhance the resolution of images from the Mars Pathfinder mission and the Hubble Space Telescope.